Your Heating System Is Starting To Fail: Repair Or Replace? Home / Blog / Your Heating System Is Starting To Fail: Repair Or Replace? As with any type of machinery, the lifespan of a heating system is finite, and at some point the most rational thing to do will be to replace it. In order for your heater to last as long as possible and also run economically, proper and regular maintenance is very important. A system may work fine without maintenance for a long while, but behind the scenes, parts will be deteriorating, and the system will gradually become less energy efficient. 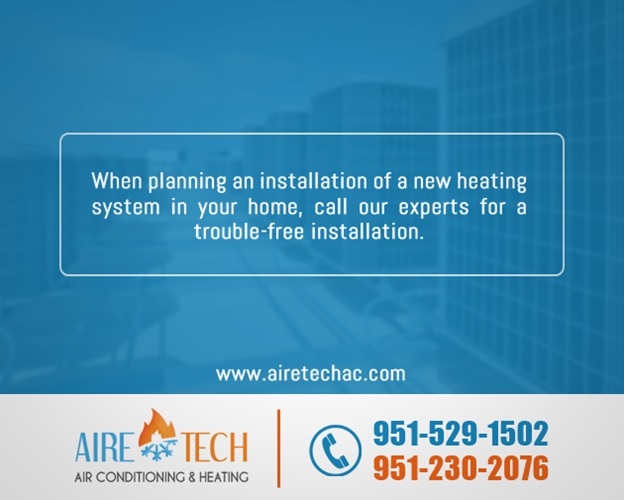 Aire-Tech AC and Heating is a company with years of experience in installing, maintaining and replacing all types of heating system, and we are a great choice of heating replacement service in Moreno Valley CA. Modern heating systems are built up of many parts and components, and wear and tear is only natural with long-term use. When inspecting a system, one can expect to find buildup of debris and sediments, cracks, leakages, and also defective electrical or mechanical parts. If maintenance is lacking, many of these minor issues can lead to larger malfunctions or even a complete breakdown, as failing components will put stress on other parts of the system. Regular maintenance is the key to avoiding this. What do I do when there is a problem with my heating system? Even if the heater has not shut down completely, there can be other signs that your system is in need of some attention. One thing to look out for, is if the energy needs of the system appear to increase considerably over a short period of time, or that the heater is noticeably less effective than it used to be. Other things to look out for are mechanical noises, electrical fuses blowing, or the smell of burning. Also, a noticeable buildup of dust or particles in your house could also indicate an issue with the system. If there is an issue with your heating system, consulting the troubleshooter on our Website is a good way of making a quick assessment, and can help you determine if you are in need of professional assistance. If you are in need of assistance, there are several things worth considering when choosing a contractor for repairs or system replacement. Finding a contractor with the skills and knowledge to provide you with the best solution, is the most important. Choose a licensed technician, as this will ensure that he or she has taken the required training. Also, check that the company is insured, and that their insurance has liability coverage. A good contractor should provide you with the best options for your particular situation, offering guidelines as to how you can save the most, both in the short term and long term. The contractor will be able to advise you on which type of system, and which size will be most effective and energy efficient. Aire-Tech AC and Heating is a solid company with years of experience, and is a superb choice for heating replacement service in Moreno Valley CA. Contact us about any aspect of the installing, repairing and maintaining of heating systems, either through our Website, or by calling us at 951-926-1002. We also offer a 24/7 emergency service.